As the name suggests, a summerhouse gets a lot of use during the warm months, when people want to relax in their gardens but not have to do so in the glaring sunshine. 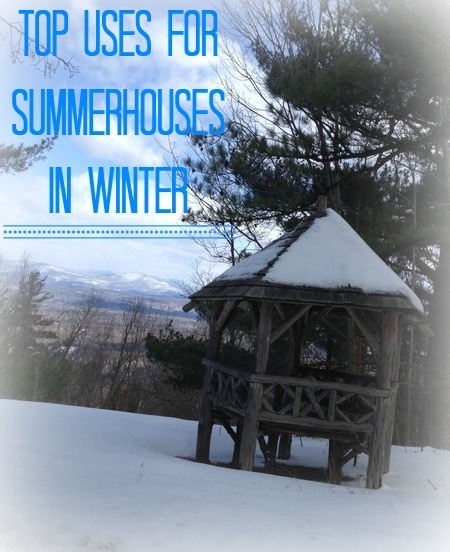 However, there’s no reason you shouldn’t get value from your family summerhouse all year round – even in winter. There are all sorts of ways you can continue using your summerhouse when the colder weather sets in – below is a selection of just several means of getting the most from the building. If you have school-age children, you’re probably well aware of how much they delight in having their friends to stay over, and you can add an even more exciting elements if you let them have a sleepover in the summerhouse. If you’re confident they’re of an age at which you know they can be safe sleeping outdoors in the garden, you could arrange for a few of their friends to come and spend the night while enjoying peace and quiet in the main house. Meanwhile, if you’re concerned that they won’t be completely safe sleeping in the summerhouse, you could let them stay there in their pyjamas with heaps of snugly blankets and pillows until a certain time, at which they’ll have to return to the main house for some sleep. Looking at the night sky can be relaxing and interesting, and the summerhouse is a great place to position your telescope for a bit of shelter from the elements while you observe the constellations. If you have windows that open or a folding section of the roof, you can extend the telescope through this opening for an even better view. Summerhouses are ideal places for indulging a variety of hobbies, one of which is brewing beer. This type of building usually has plenty of space, and may not be used by other household members much during the cooler months, making it ideal as a home brewery. You may need to invest in some specific storage for your equipment, and ensure the summerhouse is secure to prevent little ones from getting inside. Although summer is known as the party season, there’s no need to forgo events when you have a summerhouse to keep everyone safe from the chill! Whether it’s a birthday party, celebration of an achievement or a festive party to celebrate Christmas, holding a party in the summerhouse can be pleasant all year round. If it’s extra cold, consider picking up some portable heating devices, or installing a solar-powered heater in the building. If you have a large summerhouse, you might be able to accommodate quite a few people for a party, while more compact buildings may require some overspill into the outdoor area. You can keep partygoers warm when they’re outdoors by investing in an attractive and warming chiminea or patio heaters. You could also add interest to proceedings by treating invitees to a freshly-baked pizza from an outdoor oven, or even whip out the barbecue to get year-round value from the appliance!